It’s April, which means Louisville is abuzz with excitement about the Kentucky Derby, and all the fun and festivities that surround it. We’re excited,too, especially because we’ll be taking part in the fun as the Official Vodka of the 2018 Kentucky Derby Festival! Joyce and Autumn Nethery with Kentucky Derby Festival Foundation President, Jeff English. On April 12th, we’ll be revealing and sampling our very special, limited edition Bloody Butcher’s Creed Whiskey at our own custom-built bar on the second floor of The Palace. Our Master Distiller, Joyce Nethery, will be there to answer all your whiskey questions, and you’ll be the first to try our limited edition whiskey as a neat pour or in our Strawberry Filly cocktail. Either way, you can’t go wrong. Taste of Derby is a huge event featuring food and cocktails from the area’s best bars and restaurants. We’ll be there sampling our Original Vodka as well as our specialty cocktail. Stop by and see us to get a taste and pick up a Cocktail Passport! 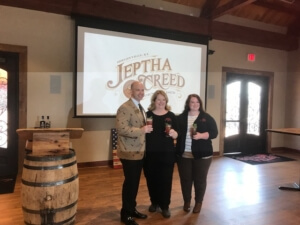 Our Jeptha Creed Cocktail Passport is a great guide for you to explore the delicious food and drink scene in the Louisville area, and then to get rewarded for it. Are you going to Fest-A-Ville? You’ve gotta come check out our Instagram-worthy bar. We’ll be in the center of the action on the waterfront, ready to make your Derby festivities deliciously delightful! You’ll be able to enjoy our vodkas on their own or in one of our two specialty cocktails – The Bluegrass Belle and The Golden Mule. The Golden Mule is our tasty take on a moscow mule, and is certain to cool you down as the festivities heat up. The Bluegrass Belle is made with our Jeptha Creed Blueberry Vodka, lime, mint, and a lemon-lime soda. It’s the perfect drink for springtime – even the color says so! You’ll notice the vibrant, purplish hue of the cocktail which comes from the natural color of the real blueberries we put in our vodka. You read that right – real blueberries. No artificial flavoring here. That’s just part of our commitment to remaining ground to glass. 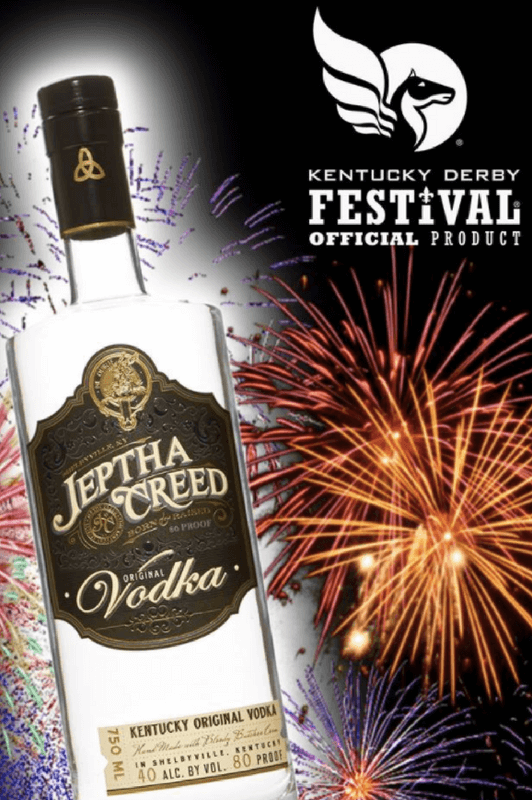 So whether you go to one or all of the Kentucky Derby Festival events, keep an eye out for us behind the bar and in our Jeptha Creed shirts. If you spot us walking around, we may just have something special for you!